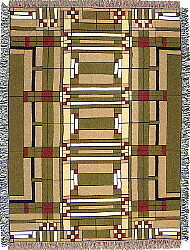 The Frank Lloyd Wright Collection® made in the USA 100% Cotton Throws are machine wash and dry. A story card is included with each throw making them excellent gifts. 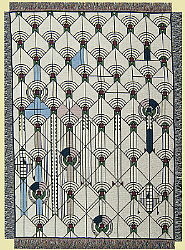 April Showers is a 1927 design by Wright, one of a series proposed for the covers of "Liberty" Magazine. 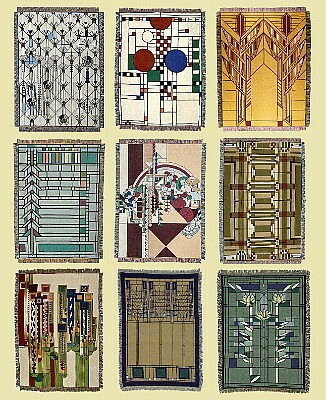 Thought to be too radical, the designs were never published. The Coonley Playhouse throw design is inspired by the art glass windows in this famous private kindergarten for gifted students in Riverside, IL. The Dana Sumac throw design is inspired by the multiple double sumac windows that form a semi-circle seating area to the north beyond the dining room in this Springfield, IL home. Of particular note: this throw is extra plush caused by extra canary colored yarn woven in to create the stained glass background color. 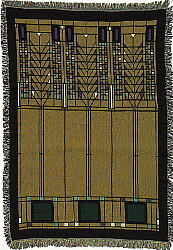 The Martin House Window II design is inspired by the windows adjacent to the pier clusters that form the Prairie School appearance of this spectacular house in Buffalow, NY. 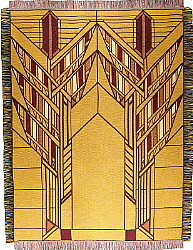 May Basket is another 1927 design by Wright, one of a series proposed for the covers of "Liberty" Magazine. 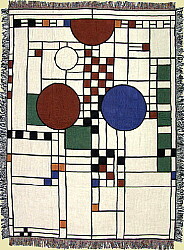 Thought to be too radical, the designs were never published. 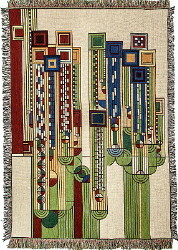 The Oak Park Home & Studio Skylight Detail throw design is based on the ceiling skylight in the loggia of the studio he attached to his Oak Park Home in 1897. 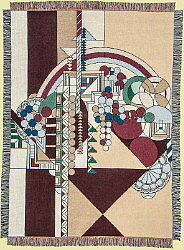 The Saguaro Forms and Cactus Flowers throw design comes from Wright's 1927 series of Liberty Magazine covers. Considered too radical, the designs were never published. 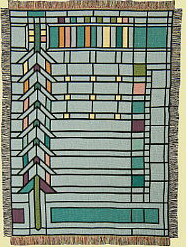 The Tree of Life Tapestry throw design is inspired by an art glass window design for the Darwin Martin house in Buffalo, NY. The Tree of Life name is not original but came to being used during the later history of the house. 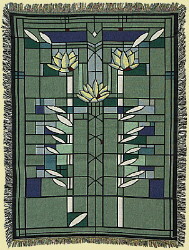 The Waterlilies Tapestry throw design is inspired by a famous art glass design found in Wright’s archives. Interestingly, to date the design has not been linked specifically to any of his commissions.